Did you know that Rochambeau met Washington in Hartford, CT for the very first time? The met at the home of Jeremiah Wadsworth, now the Wadsworth Atheneum Art Museum. 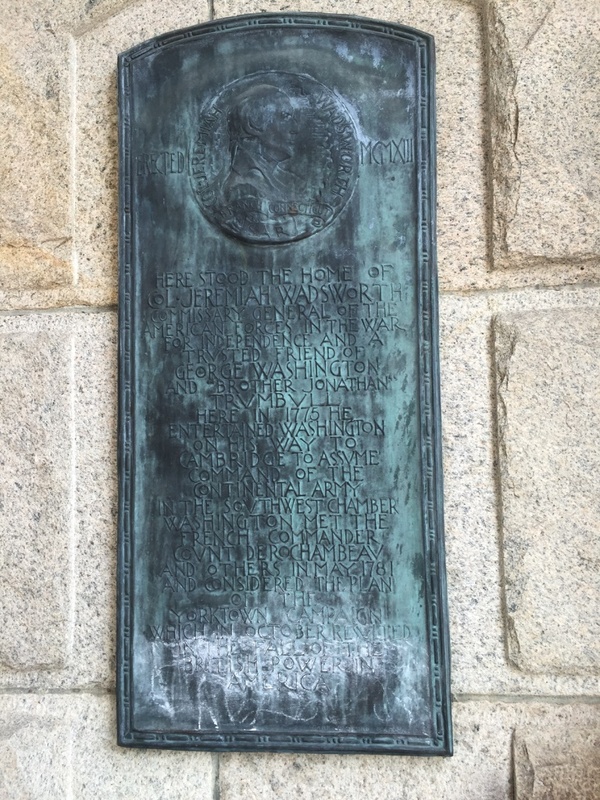 Below is the plaque that tells the story. Departure on September 23, 1781. The meetings resulted in a decision for Rochambeau and his men to stay put over the winter in Newport, RI and in Lebanon, Ct. Beyond that, Admiral de Ternay would seek more ships and Rochambeau would seek more men while the French remained on the defensive in Newport looking out for a possible British attack. Their next move would be centered around New York, the British head of operations in the North. The plaque is attached to the exterior of the building, on the left side as you face the front entrance. HERE STOOD THE HOME OF COL. JEREMIAH WADSWORTH COMMISSARY GENERAL OF THE AMERICAN FORCES IN THE WAR FOR INDEPENDENCE AND A TRUSTED FRIEND OF GEORGE WASHINGTON AND BROTHER JONATHAN TRUMBULL. HERE IN 1775 HE ENTERTAINED WASHINGTON ON HIS WAY TO CAMBRIDGE TO ASSUME COMMAND OF THE CONTINENTAL ARMY IN THE SOUTHWEST CHAMBER WASHINGTON MET THE FRENCH COMMANDER COUNT DE ROCHAMBEAU AND OTHERS IN MAY 1781 AND CONSIDERED THE PLAN OF THE YORKTOWN CAMPAIGN WHICH IN OCTOBER RESULTED IN THE FALL OF THE BRITISH POWER IN AMERICA.